The medieval town of Alcudia is known among travellers for its' amazing Mediterranean beaches. When travelling from Palma airport to Alcudia there are 2 options of transport: Taxi and Bus. Taking a taxi is the most convenient mode of transport. The taxi from Palma airport to Alcudia will cost approximately 60€ and it will take around 45 minutes. A cheaper option is the bus. The bus will take around an hour to reach Alcudia and regular tickets cost only 8€. Since recently the Aerotib buses of CTM started operating from the airport to various destinations in Palma. 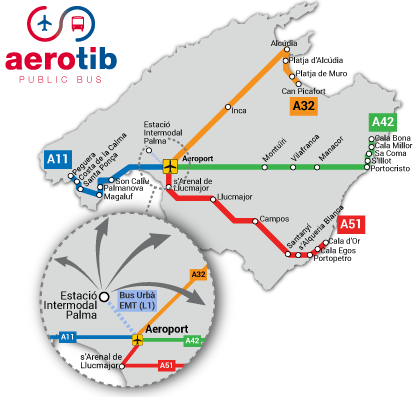 Therefore, it is now possible to travel from the airport straight to Alcudia with the Aerotib bus line A32. The average travel time is 60 minutes, but the waiting time can vary since those services usually stop from 01:00 p.m to 06:00 pm. How much is the bus from Palma airport to Alcudia? Regular one-way tickets cost 8€ and can be purchased straight from the driver with cash. Waiting time varies and can be as long as 5 hours. The Aerotib bus A32 runs from 11:00 a.m to 07:45 p.m with a long break from 01:00 p.m to 06:00 p.m. The Aerotib bus stop is located right across the arrivals hall from exit 4. The Aerotib buses are comfortable and the tickets are cheap. However, they do not have a fixed time schedule and the waiting time can be as long as 5 hours. As an alternative, you can take the public airport bus No.1 to the central bus station and board onto bus L351 towards Alcudia from there. You cannot buy an Aerotib bus ticket in advance; therefore, if there are many people waiting for the bus you may have to catch the next one. An Aerotib ticket is only valid for one transfer on the day of purchase. Children under 4 years of age travel for free. If you feel more relaxed knowing that somebody is waiting for you, you may as well book a Welcome Pickups transfer. As soon as you arrive at the airport you will be greeted by your driver. He will be waiting for you at the terminal of your arrival with a sign that has your name on it. Your driver will help you out with your luggage and together you will make your way to the vehicle. While he is driving you to your accommodation, the driver can give you some tips and recommendations on what to do during your holidays in Mallorca. Our drivers are hand-picked and speak fluent English. No need to worry about miscommunication issues that you may face with the local taxi drivers regarding your destination. Relax and enjoy your ride. When it comes to travelling from Palma airport to Alcudia, taxis provide the most convenient and comfortable services. Always pick a taxi from the official taxi ranks and never accept transfer services from random individuals. Licensed Palma airport taxis can be recognized by their white color and taxi roof signs. When the traffic flow is moderate, the average trip duration is 45 minutes. Since there is no fixed price for the transfer from Palma airport to Alcudia, your trip will be charged on the meter, based on distance. However, the estimated cost of the journey amounts to 60€. Additional costs for late-night driving, driving on public holidays, or extra luggage may apply. If you want to avoid the busy airport of Palma and head straight to your hotel, then it is ideal to hire a taxi. Moreover, taxis are your only transfer option if you arrive at the airport after 08:00 p.m. It is advisable to negotiate a fixed price with your driver for long trips outside of the city of Palma. Always pick a taxi from the official ranks. Make sure that the taximeter is running properly. Not all taxi drivers are bilingual. It is recommended to pay for your ride with cash. How much is a taxi from Palma airport to Alcudia? The average price of taxi trip from Palma airport to Alcudia is 60€. Without traffic, the ride takes around 45 minutes. How much is a bus ticket from Palma airport to Alcudia? Regular bus tickets for the CMT Airotib bus A32 cost 8€ and you can buy them straight from the bus driver with cash. How far is it from Palma airport to Alcudia? The town of Alcudia is approximately 61 km from Palma airport and you can get there either by taxi or bus.